Jungle Theatre Company facilitated curriculum-based drama for all grades at Grove Primary during 2005. 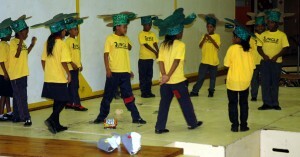 In 2008 Jungle Theatre Company established an intramural programme Kiss Waste Goodbye linking three local schools, Muizenberg Junior, Zerilda Park Primary and Levana Primary. Working with Grade 4s, Jungle Theatre Company built large parade puppets from waste for Pick Up Litter Parade with visual artists Junkanew. Through a series of intra mural workshops, the following year’s Grade 4s created a short play, dance and made costume hats. A combined showcase where the three schools brought their messages about reduce, reuse, recycle together through dance and song was opened by Councillor Demetri Qually.